The European Tour has announced that the Lough Erne Resort will not host the 2017 Irish Open. There were doubts in January that the Fermanagh course may not stage the event and this was confirmed on Monday. The Lough Erne Resort said it was extremely disappointed, adding that the European Tour had decided to "change the venue to a links course". Tour officials have already visited Portstewart to check its suitability to stage the Irish Open. In April 2014, it was announced that the 2017 event would be held at Lough Erne and supported financially by the Northern Ireland government. "During a recent visit to the Lough Erne Resort, I was delighted to meet with the owners and to learn more about their significant investment plans for the golf course and hotel," said Keith Pelley, European Tour Chief Executive, on Monday. "It is a beautiful facility with an outstanding championship golf course designed by Sir Nick Faldo. "While the 2017 Irish Open will not be staged at Lough Erne, the European Tour looks forward to working with the new ownership consortium, and I am confident that the Lough Erne Resort will host an event with the European Tour in the future." 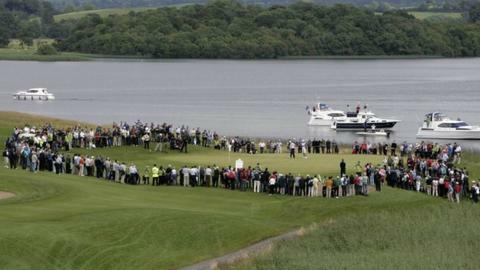 The Lough Erne Resort failed to persuade the European Tour to keep the event at the Fermanagh venue. It added: "Over the last several months, senior tour officials began telling us that European Tour management was considering a 'traditional links course strategy' for future Irish Opens. "We have remained steadfast in our position not to accept this change from the Tour, and we have spent the last few months trying to work with Tour officials at the highest level to persuade them to keep their commitment to Lough Erne Resort and the region. "However, despite our willingness to work with the Tour in every way to convince them to maintain their commitment, they have made the decision to change the venue to a traditional links course in 2017." Meanwhile, Danny Willett's first European Tour appearance since winning the Masters on Sunday will be next month's Irish Open at the K Club.